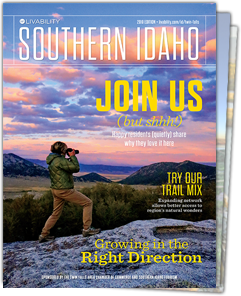 Southern Idaho’s thousands of acres of high-desert public land are perfect for off-road lovers. Jump on your UTV, ATV, or RAZR and start exploring! South Hills – There are tons of trails on both sides of Rock Creek Road in the South Hills. If you’re new to the area, try riding the trails along the base area of Diamondfield Jack and exploring from there. You can do longer rides, if you wish, or shorter rides with kids or friends. From this trailhead, it’s possible to ride all the way to Jackpot, Nevada, for lunch or explore other parts of the trail system. Carrying a trail map and a GPS unit with you — as many people do — will help with navigating the trail system and reaching your destination. Big Southern Butte – This volcanic dome (don’t worry — it’s dormant!) near Craters of the Moon is home to a 68-mile route that will take you to elevations of over 7,500 feet. The loop begins and ends at the Arco City Park; head out from there and you’ll see the first junction about 18 miles out in the desert. Extra fuel is a good idea for this trip. Snake River Canyon Park – Just east of Highway 93 and bound on one side by the Snake River Canyon, this park is a popular spot for ATV riders and shooting enthusiasts. You’ll find several hundred acres of great public land to ride through this area near Jerome, including plenty of places where you can overlook the Snake River Canyon. Avoid the Devil’s Corral Canyon area, which is closed to motorized vehicles, and be aware of your surroundings — especially of people who might be out for target practice. Camas County Trails – Camas County has miles of loop trails for ATVs, including rides along the South Fork of the Boise River, Big Smoky Creek, and along mountain ridges. Camping is available throughout the area if you’d like to plan an overnight adventure.